During our New York visit last weekend, I made it a point to go down to my old stomping grounds – Soho and the NYU/west village area – from when I spent a summer living in Manhattan. There are just so many tiny spots in these neighborhoods to eat and drink well in countless cultures and styles. Italian cuisine is foremost though; it's only 5 blocks from Little Italy. I love this part of New York! On MacDougal Street, between Bleecker and Houston, there's one of my favorite hidden gems: Focacceria. It's a tiny little place, split between perhaps 6 tables outside and 6 inside. The menu is simple: Italian classic entrees and fresh made pasta dishes along with an assortment of wonderful classic hot and cold Italian sandwich combinations on the gorgeous tomato or rosemary focaccia bread that is made fresh in the store each day. They'll give you some bread for the table no matter what. So even if you order primavera or melanzana or gamberi or vodka or 1 of their other 25 pasta sauces/dishes over 1 of their 8 pasta types – or get chicken or veal parmesan, picatta or marsala or ravioli, you'll still get to try the focaccia. Their entrees are fantastic and fresh, but for me I need more than just a little hunk of focaccia. I need the full Italian sandwich on focaccia and the light green mesclun green salad that accompanies it. 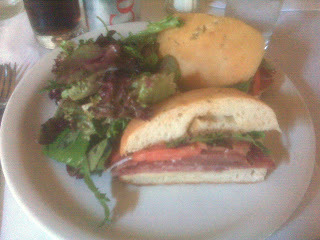 From combinations like fresh mozzarella with tomatoes, roasted peppers and olive oil to prosciutto, sopresseta, fontina, tomato and greens to sandwich versions of eggplant or chicken parmesan, I cannot and never was able to resist getting ANYthing from Focacceria that was not squarely situated in between two pieces of that lovely focaccia. It's pillowy and warm, crusty on the outside with zings of flavor from top to bottom. Throw in my personal favorite salami, prosciutto, provolone, tomatoes and greens and I'm in heaven. Every bite has tang and salt, crunch and softness. Makes my mouth water just sitting here. If you've ever been in this neighborhood, you might have walked right by the tiny Focacceria. But if you have, you just walked by the delicious sparkle of this village gem – the unrivaled focaccia.